Protect contents from dust, sand, dirt and water! 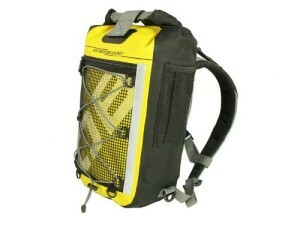 The OverBoard Pro-Sports Waterproof Backpack 20 Litres – Yellow has no zips which means no leakage. This waterproof rucksack has a seamless electronically-welded construction and a simple to use two-way sealing system, making it fully submersible. From the large front mesh zip pocket to the padded shoulder straps and air-flow back panel, this feature-packed Overboard Waterproof Backpack is a comfortable and handy bit of kit for any water-based sportsman. – Roll-top 100% waterproof rucksack (Class 3) – Floats safely if dropped in water – Protects contents from dust, sand, dirt and water – Unique High Frequency welded construction – Two-way sealing system (top or side) – Padded shoulder straps and lumbar support – Comfortable back panel with air-flow design – Large front mesh zip pocket – Super reflective strips on the front of the bag and both shoulder straps – Adjustable sternum strap and waist belt – Large outer elasticated mesh side pocket and a top carry handle – Height: 43cm / 17 – Width: 24cm / 9.5 – Depth: 16.5cm / 6.5 – Capacity:1,200 cubic inches (20 Litres) – Weight: 1.27kg – Large internal zip pockett.